Heaven help anybody that the media or the government turns against – that’s what I told 'Russia Today' TV last year, but the interview was never broadcast. Hardly surprising, really, since in Russia the media mostly is the government. In Russia, they don’t have a press regulator like we do. But is our system any better? 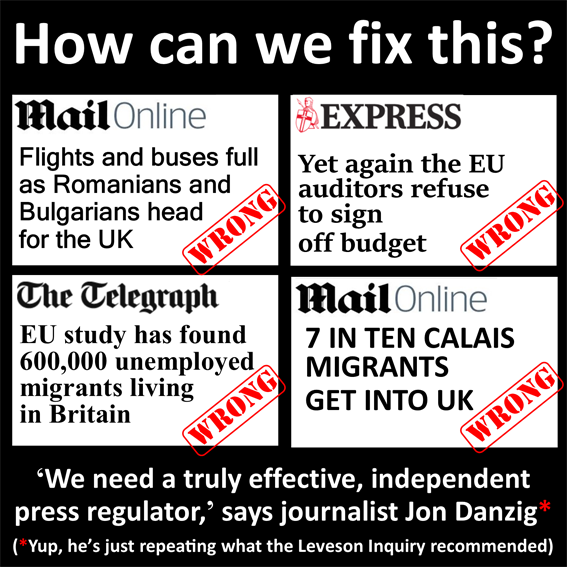 Our press regulator in Britain is supposed to monitor and resolve inaccuracies in our newspapers. It used to be called the PCC – Press Complaints Commission. Last year they changed their name to IPSO – the Independent Press Standards Organisation. Are they any good? Not if my experience, and those of many others, are anything to go by. Last year the Daily Mail published a New Year’s Eve story claiming that all buses and planes from Romania and Bulgaria to the UK were full-up and sold-out. According to Daily Mail, overwhelming numbers of Romanians and Bulgarians were planning to travel to the UK because work restrictions were being lifted. The Mail claimed this meant that 29 million Romanians and Bulgarians could now come to Britain to work (a ridiculous claim). So high was demand to come to Britain, asserted the Mail, that one airline had to double its flights, one-way tickets had shot up to £3,000 each and all buses to the UK from Bulgaria had no seats left. The problem? It was all untrue. With the help of Romanian journalist, Alina Matis, we analysed the Daily Mail article line-by-line and found 13 serious errors and inaccuracies. The Daily Mail refused to apologise or to accept that their story was inaccurate. So I complained to the Press Complaints Commission (now called IPSO). My blog called, '13 reasons why I’m taking the Daily Mail to the Press Complaints Commission' attracted over 80,000 readers in the space of a week. There followed seven months of protracted correspondence with the PCC, during which they insisted on my silence, otherwise their investigation couldn’t proceed. In the end, I won. The Press Complaints Commission agreed that the Daily Mail had breached its Editors Code of Practice on accuracy. But the PCC refused to make their findings public. Neither did they insist that the Daily Mail publish that they had broken the press industry’s code of ethics. Instead, the Mail was simply requested to publish a tiny, and I believe, quite meaningless correction, without any reference to the PCC’s findings. Could this be something to do with the fact the the Editor of the Daily Mail, Paul Dacre, is the Chair of the press regulator's Editors' Code of Practice? If I hadn’t made public the findings of the PCC, nobody would have ever known about it. For me, it was a wasted seven months, during which I couldn’t report anything about the investigation, the procedure was long-winded and off-putting, and the outcome was entirely inadequate. I wouldn’t volunteer to go through the same process again. But that one Daily Mail story was just one example of many stories published daily by the UK press that can do great damage to individuals, communities and society as a whole. The Daily Mail article claiming that so many Romanians and Bulgarians were coming to the UK resulted in hundreds of pre-moderated comments posted in their readers section revealing frank hatred for foreigners generally, and Romanians and Bulgarians in particular; and all based on an untrue story. However, the Daily Mail refused to accept my complaint that their story promoted xenophobia and discriminated against Romanians and Bulgarians. The Press Complaints Commission couldn’t assist with that part of my complaint either. That’s because their Editors Code of Practice only allows complaints of discrimination if the story discriminates against a named individual – but their code doesn't count if there is discrimination against an entire race, nationality or religion. How ludicrous is that? It’s not an overstatement to claim that newspaper lies can cost lives – either by ruining peoples’ lives or helping to bring them to a premature end. But what happens when newspapers do not responsibly and accurately inform, especially on issues of vital importance that could affect, for example, whether Britain stays a member of the EU, or whether we accept or reject refugees? If our opinions are based on false information being fed to us by inaccurate newspaper stories, what does that say about our opinions? For example, last year the Daily Express claimed that independent auditors have repeatedly refused to sign off the EU accounts. It’s completely untrue. The EU accounts have been passed by the independent auditors every year since 2007 as accurate, legal, regular and reliable. The Telegraph claimed that according to an EU report, 600,000 EU migrants in the UK are unemployed – again, not true (or at least, misleading). The number mostly included those who are economically ‘non active’ – but that’s not the same as being unemployed. To be officially unemployed, a person must be ‘economically active’ and seeking work that they can take up. The 600,000 figure mostly included pensioners, full-time parents, students and those unable to work because of illness, none of whom could be categorised as unemployed. Last month the Daily Mail claimed that 70% of Calais migrants were getting to the UK. The claim had no foundation – the Mail had misquoted the Chief Constable of Kent Police, who after I alerted him to the Daily Mail’s error, demanded that the newspaper run a correction. This the Daily Mail duly published – but their correction was incorrect (and tiny). We need a better way to bring these inaccurate newspapers to account. In doing so, I firmly believe that we won’t lose a free press; we will actually gain a press that’s free of lies and misleading reports that can cause profound damage to people and communities. The current system of press regulation is woefully inadequate. The Leveson Inquiry into the practices of our newspaper industry came to the same conclusion, calling for a new independent press regulator, with the scope to initiate in-depth investigations into serious malpractice by newspapers and the power to impose fines of up to £1m. But three years after Lord Leveson reported his findings to Parliament, we still don’t have a ‘Leveson compliant’ press regulator. That’s why we need to step up the campaign for a free but accountable press; the reason that the group, Hacked Off​, was set-up. I hope they won’t have to exist for much longer, because I truly want them to succeed. Please support their work.